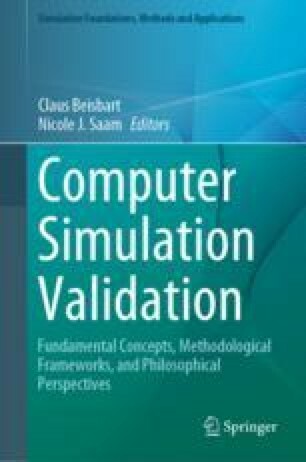 The thesis of a hermeneutic perspective on validation in simulation has existed ever since Kleindorfer et al. (Manag Sci 44:1087–1099, 1998) published their overview of various positions in the philosophy of science. This chapter introduces the distinction between a hermeneutics in validation and a hermeneutics of validation. I argue that the hermeneutic perspective according to Kleindorfer, O’Neill and Ganeshan, which qualifies as a hermeneutics in validation perspective, is rather fruitless. Instead, a hermeneutics of simulation validation is proposed on the basis of Gadamer’s philosophical hermeneutics. The goal of the hermeneutics of validation is to understand simulation validation. The challenge is to set up a hermeneutic situation in the first place. Hermeneutic aims to demonstrate how simulation validation is historically situated, revealing the hidden prejudice (prejudgement) in validating, and distinguishing between legitimate prejudice and prejudice that has to be overcome. Understanding simulation validation is a dialogic, practical, situated activity. The author thanks Claus Beisbart for helpful discussions concerning this manuscript. Ramberg, B., & Gjesdal, K. (2005). Hermeneutics. In: E. N. Zalta (Ed. ), The stanford encyclopedia of philosophy (2005 ed.). https://plato.stanford.edu/archives/win2014/entries/hermeneutics/#Pragmatism.